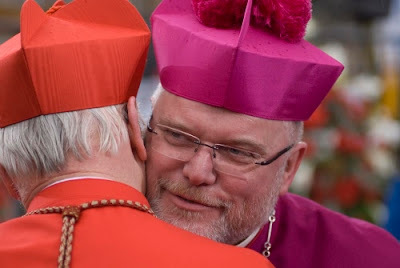 Fresh from a private audience earlier this week with his second predecessor, Archbishop-elect Reinhard Marx of Munich and Freising formally touched down in his new charge yesterday in advance of his Saturday installation. 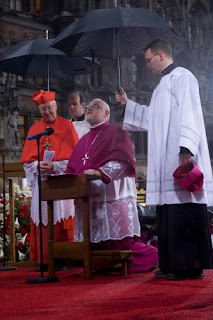 As rain fell on the Marienplatz -- the great square outside Munich's Cathedral of Our Lady -- the long-awaited successor to 79 year-old Cardinal Frederich Wetter performed the traditional homage to the Mariensaule, the statue of Mary that's stood atop a pillar there since 1638 as a "monument of peace." Joined by the city's mayor and other top politicians as a large crowd looked on, the rite was the final "station" of the customary three-stop tour that sees each incoming head of Germany's Catholic heartland whisked to the ancient see's most venerable foundations: the 12th century Benedictine monastery at Scheyern, and Ss. Peter and Paul at Feldmoching, along the city's northern edge, where a church was first built in the 6th century. At Saturday's installation, Marx becomes the 73rd successor of St Corbinian, the "apostle of Bavaria" who settled at Freising in the year 723, his relics still enshrined in its cathedral. The Pope surprised most observers with his November appointment of the 54 year-old bishop of Trier to the post for which Fr Joseph Ratzinger was made a bishop and held from 1977-81. Described as "outspoken" and a "larger-than-life" character who's shown a flair for mixing it up in Germany's political and media circles, the sociologist-by-training -- and longtime head of the episcopate's social justice efforts -- had largely been viewed as in line for the archbishopric of Berlin. 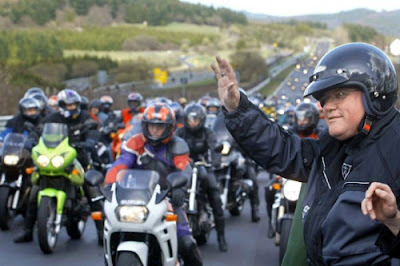 After an unusually protracted yearlong vacancy, however, his dispatch instead to Papa Ratzi's home diocese places an even more pointed stamp of papal approval on him, one which could well see the sometime biker (above right) riding off in mid-February with the chair of the German bishops' conference in succession to its longtime head, Cardinal Karl Lehmann of Mainz, who cited a "necessary generational shift" at the helm among his reasons for leaving the influential post midway through his fourth six-year term. With Wetter's 80th birthday just three weeks away and the pontiff's longing for his homeland remaining strong, better still are Marx's odds of donning the red hat of a cardinal at his predecessor's next consistory. In accord with the longstanding practice of Munich's archbishops, the post's 13th holder has incorporated the traditional Moor's head onto his coat of arms, but leaving Corbinian's famous pack bear behind in Rome... with the Pope.